Houseplants aren’t only good for cleaning the air-they can also add a fresh and stylish touch to any home decor. Here’s how! Adding houseplants is one of the simplest ways to add color and style to any décor. Here are some ways to decorate with them! Accent windows and high ceilings with hanging plants. A lush houseplant can also brighten up or conceal a less than desirable view and add privacy. They can be displayed by either a hanger attached to the ceiling or a high stand. Hangers come in all kinds of colors and styles, from polished metal to woven works of art. High stands come in various wood finishes, metals, and even plastic. They consist of either a long pole with a hook or hooks on top, or a pole that goes from ceiling to floor that you can attach the plants to. Trailing plants and vines look especially good when placed on a high shelf and allowed to tumble down. 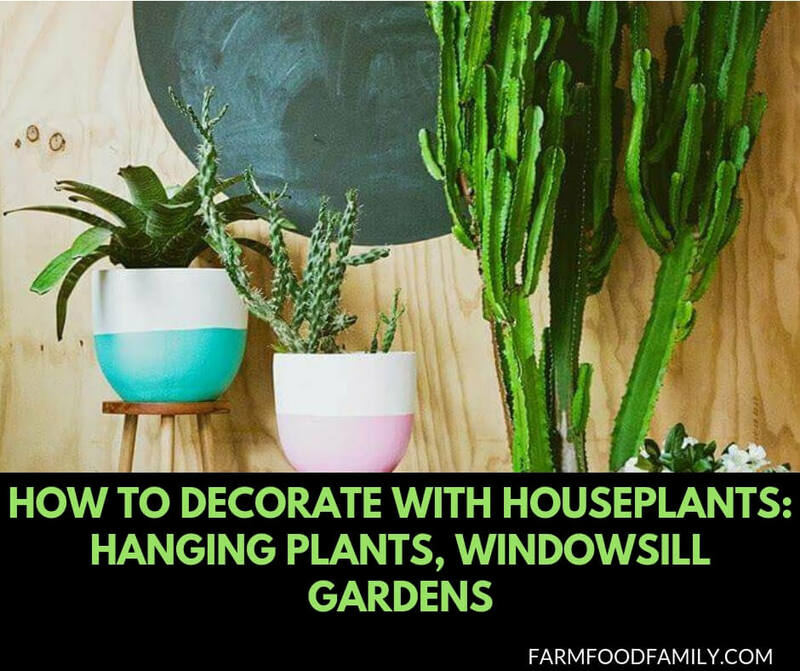 Grouping plants on tables, shelves, and windowsills can have a striking effect. Choose plants of differing heights and contrasting foliage. For example, the large variegated leaves of a Dieffenbachia provide a vivid backdrop to brightly colored African Violets or dark and glossy leaved Philodendrons. In areas that don’t get high traffic experiment with plants that have trailing stems that tumble over the sides of shelves and tables. Be sure to use trays or planters to protect surfaces from water damage. For a relaxed, subtle effect, tuck small houseplants on to the shelves of a bookcase, curio cabinet or entertainment center. Ivies look especially nice. This is a good way to add a personal touch to a dorm room or small office. To display a particular group of houseplants together that are around the same height, use some old books, boxes, or anything else that can be stacked in a staircase formation and cover them with a piece of fabric. Arrange the plants on the “stairs” for an easy and neat arrangement. An old ladder can also be used for this affect. Paint or stain it to match the décor of the room it will be in. For kitchens with a sunny window, fill with pots of herbs. Not only does it look great, it’ll provide an instant herb garden. Snip off what’s needed and add for instant flavor! A sunny window will also allow flowering plants to flourish and add color to the room. Try geraniums, jasmine, or begonias. Put an unused fireplace to work. Tuck a group of houseplants inside. Use tall bushy ones in the back and sides, and fill in the rest of the space with smaller ones. Experiment with trailing and climbing varieties! When decorating with plants, remember to be sure they will still get the light and air circulation they need. For dark corners or shelves, this can be accomplished by regular rotation. Keep plants where they’ll get the light they need for a few weeks, then put them in the darker area. They will do just fine for a month or so, then they’ll have to rotate to the lighter area for a week or two. To prevent water damage, make sure there are trays or saucers under all of your plants, and drain them well when watering. If using ceramic planters, remove the plants from them when watering so they will drain properly. When choosing plants for décor, keep in mind any high traffic areas and be sure to use sturdy plants that can hold up to abuse. Other things to keep in mind are light levels and pets and children. Make sure to choose plants appropriate for the light levels in the room they’ll be in (or purchase grow lights) and keep delicate or toxic ones away from areas easily accessible by pets and children.